Buick is activating a new partnership with the NCAA by asking fans to create films that highlight the accomplishments of former student-athletes who are now making a difference in their communities. The activation, which was announced by the automaker at the Detroit YMCA today, is part of a deal that will involve the NCAA, as well as media partners, Turner and CBS Sports. The Buick Human Highlight Reel will launch at the beginning of the NCAA Division I Men's Basketball Championship. A collection and archive of complete stories will appear online at www.ncaa.com/buick. Additionally, Buick will be the exclusive title sponsor of a 30-minute television show featuring select Human Highlight Reel stories that will air prior to the 2011 NCAA Men's Final Four semifinal games on April 2. The filmmaking project complements the recently announced Buick Achievers Scholarship Program, which will provide up to $4.5 million-a-year in scholarship funds to 1,100 college-bound students nationwide who excel both in the classroom and in the community. The scholarships are renewable for up to five years. "While the scholarship program will help foster the next generation of leaders, the Buick Human Highlight Reel will celebrate former college student-athletes who are leading winning efforts in their communities," said Tony DiSalle, U.S. vice president of Buick marketing. "By sharing their stories Buick and our partners hope to inspire others to go above and beyond to help others achieve their fullest potential in life." "The Buick Human Highlight Reel shows the continued leadership and dedication that student-athletes have once they complete their academic programs and become active in their communities or involved with broad initiatives that have a positive influence on the lives of others," said Peter Davis, NCAA director of championships and alliances. "Through this partnership, Buick will have the ability to create year-round branded content, distributed on multiple NCAA media platforms including NCAA.com, around all 26 NCAA Championship sports," said Will Funk, senior vice president of NCAA Partnerships and Branded Programming within Turner Sports Ad Sales. In addition to the televised stories, the Buick Human Highlight Reel's online component will feature videos by filmmakers associated with Zooppa, a creative social network with more than 100,000 members. These amateur filmmakers will create 60-second mini-documentaries about former student-athletes who are making a difference. "By telling powerful stories of former student-athletes as part of the Human Highlight Reel video series and enabling future leaders to emerge through the Achievers Scholarship Program, Buick has clearly demonstrated their commitment to the broader NCAA community," said Chris Simko, senior vice president, CBS Sports Sales and Marketing and director, CBS Sports Properties Group. 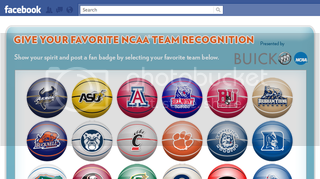 Meanwhile, today Buick also unveiled the exclusive team fan Facebook badges for the NCAA tournament. Buick is presenting sponsor on the app, which can be found at http://apps.facebook.com/ncaabadges/.